On the left the conventional morphological contrast enhanced imaging of a brain tumor with a clinical 3 Tesla MRT, on the right the protein measurement with the 7 Tesla MRT. Glioma is the most common type of brain tumor in adults. This non-neuronal type of tumor arises from glial cells – the cells that support and nourish neurons. The term "glioma" comprises a whole number of brain tumors that vary widely in grade. Some are benign and can be removed completely by surgery. In others, chemotherapy and/or radiotherapy is necessary in addition to surgical removal. In about half of all glioma patients, an extremely malignant form of the tumor is diagnosed. "Malignant gliomas respond very diversely to treatment," says Daniel Paech from the German Cancer Research Center (DKFZ). "In some of the cases, postoperative radiotherapy and chemotherapy are more effective than in others. And whether the tumor has in fact responded to treatment cannot be told before the first follow-up care exam six weeks after treatment ends." In order to choose the best possible treatment strategy for the patient right from the start, it would be advantageous to be able to assess a brain tumor's aggressiveness and future response to therapy already at the time of diagnosis. In their present study, Paech and his colleagues from Heidelberg University Hospital have now shown that this look into the future, which is so critical for individual therapy planning for glioma patients, in fact seems possible. They used an extremely powerful 7-Tesla MRI scanner to image proteins in the brains of glioma patients. To do so, they exploited the so-called CEST effect, a chemical exchange effect between the proteins and free water in tissue. No contrast agents are needed for this examination. Paech explains: "Cancer cells grow in an uncontrolled manner, producing proteins along the way in an equally uncontrolled manner. Our study shows that the protein signal measured in the MRI image is a biomarker that is associated with survival as well as with treatment response of patients: The stronger the protein signal, the poorer the prognosis." If the MRI image at diagnosis shows that the tumor has a tendency to grow rapidly, it would be possible to choose, depending on other factors such as the patient's age, a more intensive therapy from the start in order to improve the patient's chances. 7-Tesla MRI machines of the type that was used for the present study are only available at a small number of research locations. Fewer than 100 of these scanners, which weigh 25 tons and cost over €10 million, are running worldwide. They generate a magnetic field with a strength of 7 Tesla. Conventional MRI scanners used in hospitals have a strength of 1.5 or 3 Tesla. Paech and his DKFZ colleagues from the groups led by Heinz-Peter Schlemmer, Mark Ladd and Peter Bachert are therefore already planning the next study. In a prospective study, they plan to examine in a larger patient group whether protein measurement is also possible using a less powerful MRI scanner. "If a 3-Tesla MRI machine can equally measure the elevated protein expression in the tumor, then our results may be used broadly to enhance diagnostics in glioma patients, because 3-Tesla machines are available in many hospitals," says Paech. 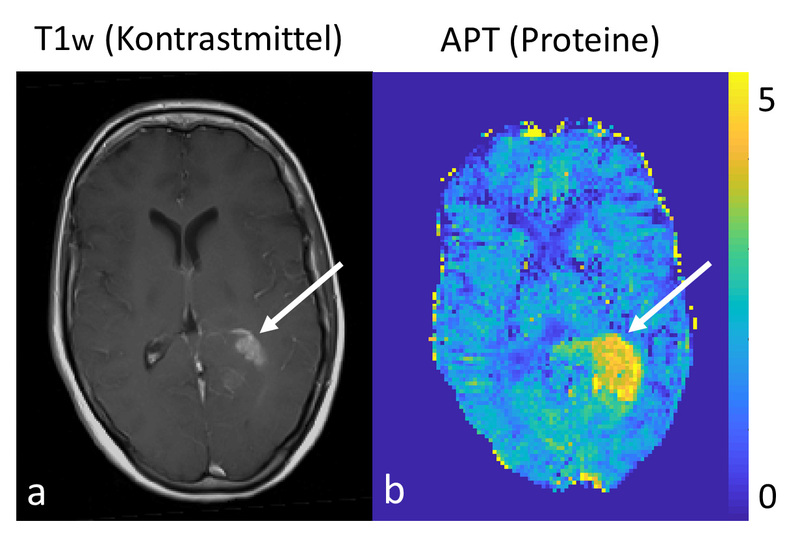 Caption: On the left the conventional morphological contrast enhanced imaging of a brain tumor with a clinical 3 Tesla MRT, on the right the protein measurement with the 7 Tesla MRT. Use is free of charge. The German Cancer Research Center (Deutsches Krebsforschungszentrum, DKFZ) permits one-time use in the context of reporting about the topic covered in the press release. Images have to be cited as follows: "Source: D. Paech/DKFZ".